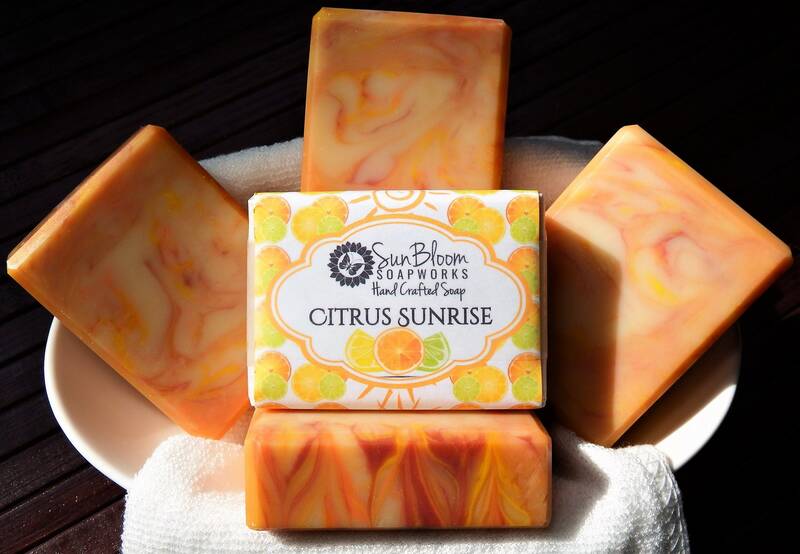 "Citrus Sunrise" is bright and fresh with notes of orange, lemon, lime, grapefruit and a touch of pineapple. Cold Process Soap, hand crafted and cut. Bars weigh at least 4oz each at packaging. CONTAINS: Coconut Oil, Palm Oil*, Canola Oil, Olive Oil, Water, Lye, Castor Seed Oil, Sunflower Oil, Grape Seed Oil, Avocado Oil, Sodium Lactate, Fragrance, Mica Colorant. *We only use palm oil that is responsibly sourced from sustainable farms. We proudly test our products on friends and family - NOT on animals. We can arrange gift wrapping and shipping! Custom requests are always welcome, please feel free to message us. We can arrange gift wrapping and shipping - feel free to message us with any requests! Smaller orders of 1-2 items are sent via USPS First Class Shipping. Slightly larger orders are sent via USPS Priority Shipping. FREE Priority Shipping is provided for any order over $75! Please be sure to enter coupon code: FREESHIP75 at checkout for your discount to be applied! Due to the hygienic nature of our products, we are not able to accept returns or exchanges as the items can not be resold. If something arrives damaged, please message us so that we can help to make it right. Your satisfaction is very important to us! One of my favorite stores to purchase soap from! The soap are individually wrapped and they are of of high quality. I purchased a bigger than usual order since I will be giving these as gifts. I know my son's teachers will love these! The seller was also kind enough to throw in some gift bags (which she sells on her Etsy website)....and they are so beautiful! I do recommend this store because of the quality of the soap. The seller is also accommodating with her customers. My order from SunBloomSoapWorks was shipped very quickly and packaged with care!